The Smart Wash Soap Dispenser from White Magic is a touch-free pump for efficient and hygienic hand-washing. 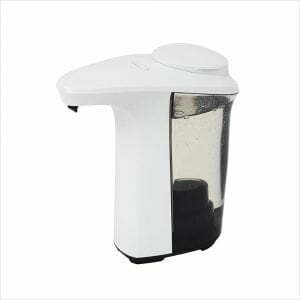 The compact dispenser is ideal for smaller spaces in kitchens and bathrooms and will dispense an optimum quantity of liquid soap or dishwashing liquid in an instant. A silicone valve helps to maintain the smooth operation and avoid messy clogs and drips and a wide opening means refilling is quick and easy. The sensor pump is powered by 4x AA batteries that lasts up to 3000 dispenses.